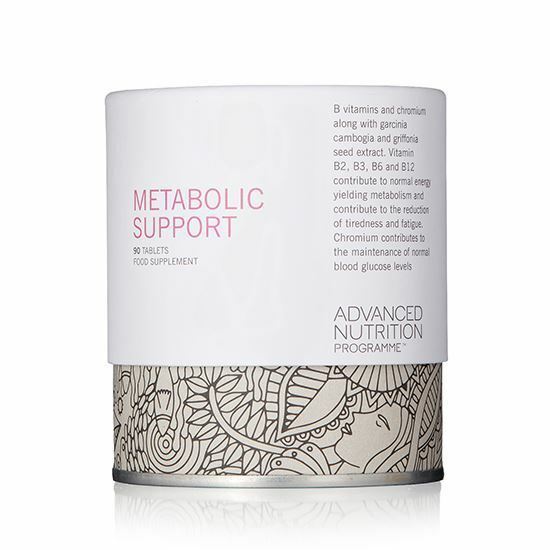 METABOLIC SUPPORT | iiaa Ltd | The UK and Ireland distributor of Environ Skincare, jane iredale makeup and Advanced Nutrition Programme. INGREDIENTS: Garcinia cambogia powder, bulking agent (microcrystalline cellulose), griffonia simplifica seed standardised extract (99% 5-HTP), vitamin B6 (as pyridoxine hydrochloride), niacin (vitamin B3 as nicotinamide), thiamine (vitamin B1 as thiamine hydrochloride), anti-caking agent (magnesium stearate), riboflavin (vitamin B2), tablet coating (vegetable protein), chromium picolinate, folic acid, vitamin B12 (as cyanocobalamin). This is best taken on an empty stomach. Take three tablets daily: one first thing in the morning and two more between meals or as professionally directed. WARNINGS: Do not take if pregnant, planning a pregnancy or breastfeeding. NO ADDED: sugar, salt, starch, wheat, gluten containing ingredients, maize, corn, yeast, lactose, dairy products, artificial preservatives, colours or flavourings. Store below 30C in a dry place away from direct sunlight and heat.